Giornale Di Sicilia: "Technological medicine"
Dr. Giuseppe Cicero interviewd by “Giornale di Sicilia” on January 15, 2019. This January 2019 our co-founder, Dr. Giuseppe Cicero, gave an interview to Giornale Di Sicilia. In the article is written about Oral3D, being included in the Forbes List and the innovation. 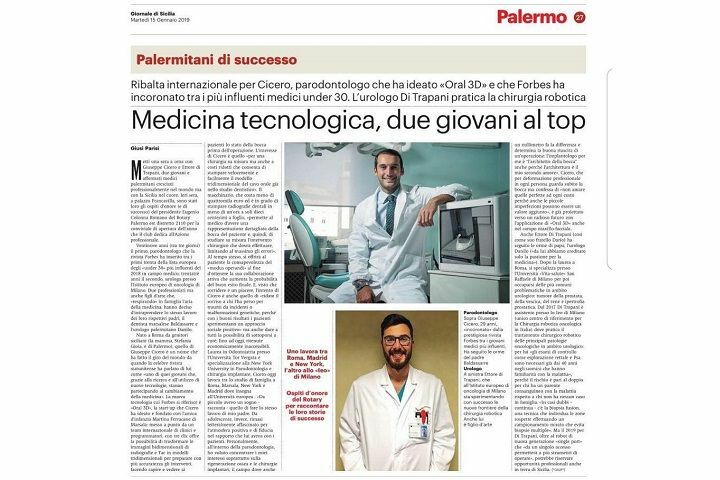 Ulisse Magazine: "In its most influential under 30s list by Forbes"
Dr. Giuseppe Cicero: "THEY CALL ME DOCTOR FORBES ..."
3D Printing Creative: "American mission for Oral3D"
TgMed: "Giuseppe Cicero and "Oral 3d": when intuitions become reality"
ENPAM: "From Tor Vergata to the States thanks to the smile in 3D"
Our co-founders at "Forbes 30 Under 30 Global Summit"